Our largest project to date. 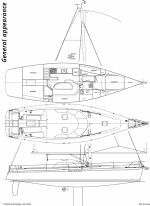 Designed by New Zealander Greg Elliott, this boat is a light displacement coach-house cruiser which boasts full headroom and full visibility from the coach-house and dinette. Construction is of a foam/fibreglass sandwich (providing maximum strength-to-weight ratio) with carbon-fibre re-enforcing in areas of high stress. The curved wrap-around windows are built from armourglass for strength and durability. All halyards and controls lead back to the cockpit to enable short-handed sailing. Our most recently completed project. A scaled-down version of our 15 metre Elliott, this boat provides the features of the 15 at a lower cost. For images of this yacht under construction visit the Blue Marine Factory Floor. Blue Marine & Fibreglass is well equipped to undertake construction of yachts of any design, from plan to commissioning. 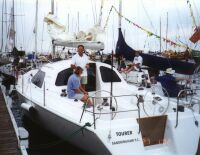 Blue Marine & Fibreglass is capable of repairing, maintaining and modifying any yacht (including keel and rudder updates).